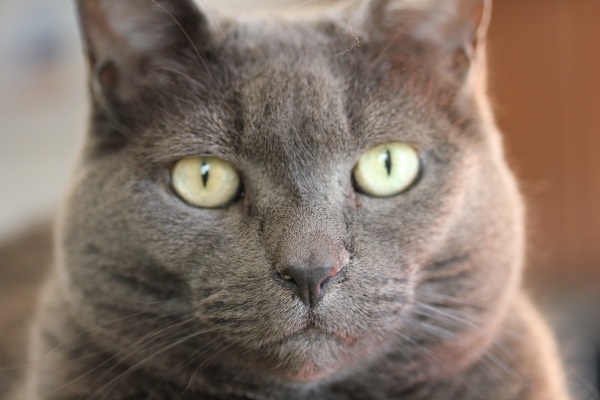 I sometimes think Smokey is not actually a cat, but an alien sent to Earth to spy on us because this is how she usually stares at us … all the time. She has an eerie talent for making eye-contact and usually does this to me while I’m watching TV, waking up, or eating. One day I swear she’s just gonna start talking and it’ll be like the female version of Stewie from Family Guy. Since she hasn’t confessed her evil plans yet, I got to work on my garden plans this weekend loading the herb container garden with basil, cilantro, parsley, and mint. 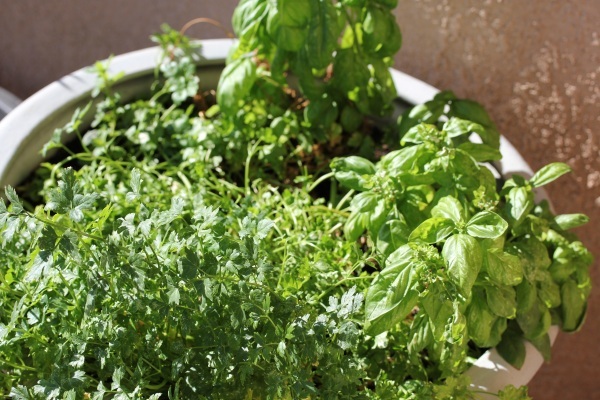 So nice to be able to step into the back yard to snip fresh herbs. And I also got working on one of our garden beds I haven’t had a chance to re-plant yet this year. 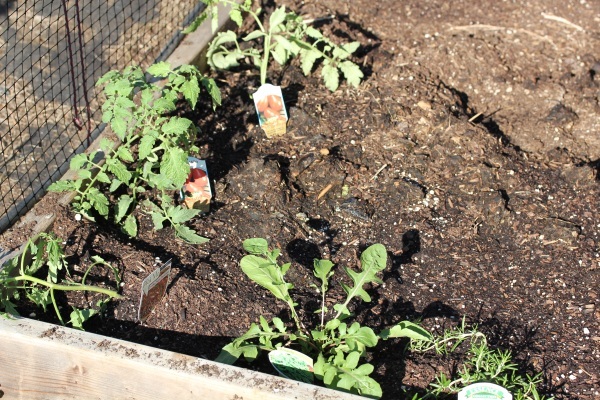 I added a few tomatoes, rosemary, dill, and arugula a long with organic soil and compost from our bin. It wasn’t an easy task in the heat! Just a couple more bags of organic planting mix and I’ll be ready to fill the rest of the bed. 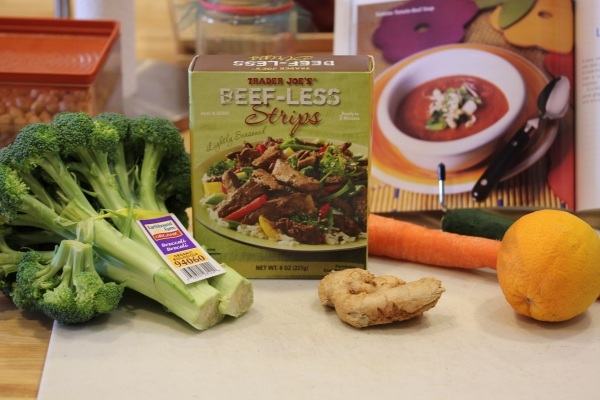 After a long run this morning, errands, and manual garden labor in the backyard, I wanted to keep dinner simple and grabbed a package of Trader Joe’s Beef-Less vegan strips from the fridge for a quick stir fry. 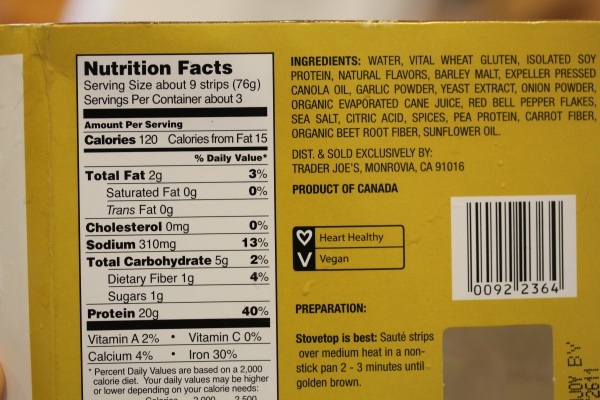 I rarely buy the strips, but they’re nice to have around for quick dinners with non-vegan hubby. 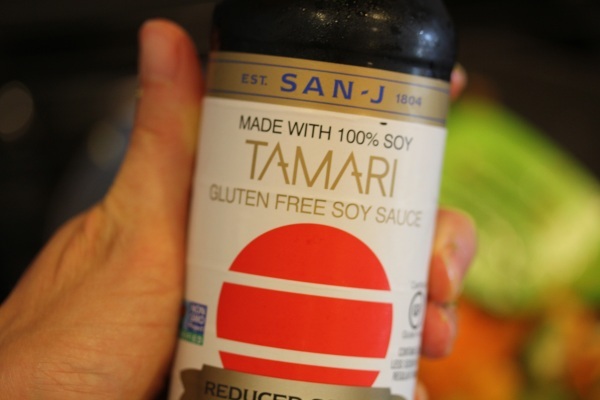 And also a quick and easy source of protein – wow on 20 grams per serving! I stir-fried the strips in a little toasted sesame oil with chopped orange. 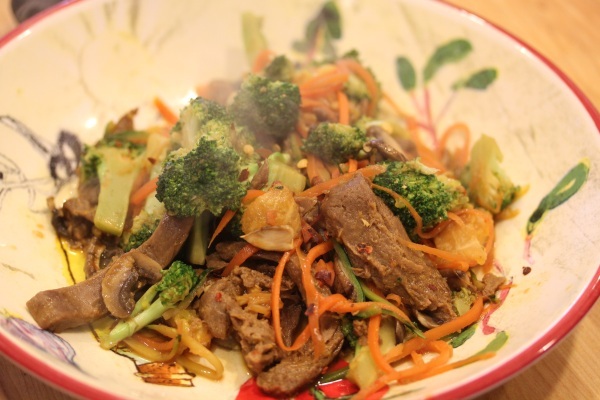 Then added broccoli, zucchini slices, carrot slices, grated ginger, and tamari. A fast, easy, and tasty dinner is served. 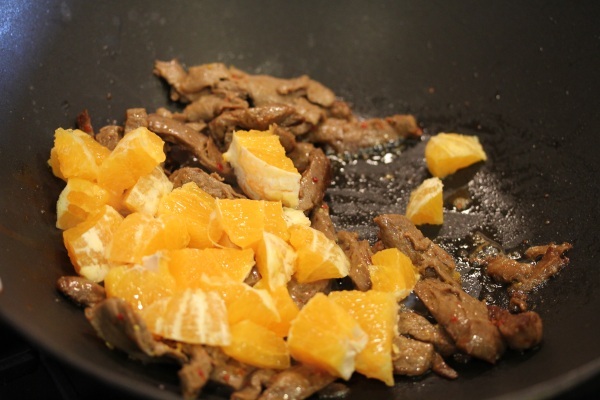 I’ve never stir-fried chopped orange before, but it added a nice flavor and texture with the tamari and ginger. Now I’m gonna go pout that the weekend is over and get some relaxing time in with hubby before the grind starts up again. the strips in a little toasted sesame oil with chopped orange = that looks lovely! smokey’s eyes are so intense. WOW!!! i love that about your cat. very funny! i have been wondering about those meat strips for a while….thanks for the recipe! I miss Trader Joe’s…so much so, I’m considering drive the hour & a half to the closest one…weird much? hooray vegan yumminess!!! this looks so tasty!!! giveaway time with Shabby Apple!!!! !